Discussion in 'Global Trip Reports' started by Jurgen, Aug 12, 2015. Excerpt: Despite its modest size , the "Baix Emporia" (also called little Emporia or Empordanet  features an amazing maze of trails linking picturesque corners. This fourth "motorcycling strolling" itinerary leads from antic ruins, to the surrealist Dali's Castle-House through peaceful landscapes and small medieval dwellings. My starting point was again Pals, the region’s best known medieval city (the same departure spot as for itinerary #3 - see listing above), and my mount remained the trusted small “shopper style” rented bike . Route C31 is an important link along the Costa Brava, joined, on this sector, by Route GI-652 leading west to Pals and Girona; I only followed it for three kilometers before bifurcating north. The first town to visit, along this fourth motorcycle itinerary, is Torrent. This small historic dwelling has the usual medieval maze of narrow streets; a charming layout which, however, squeezes the photographic possibilities, particularly when the place is undergoing improvement work. Selling old houses to non-residents, for their rehabilitation, is a mean to keep the medieval towns alive, but not always lively. The local “sweet spot” is a jam museum (“Museu de la Confitura”); it is worth a stopover, for some shopping, or just to observe the comfitures’ making and diversity . A mock up “periodic table” of comfitures classifies jam and preserves into 115 varieties. It has been devised to honor Mendeleev’s memory for the 100th anniversary of his passing. Five hundred meters farther down the road, after Torrent town, a rocky, unpaved byroad, leads to a modest megalith site. The remains of “Puig Roig dolmen” (cementiri dels moros) are a collection of widespread stones. Thought this is not the most spectacular place in the Empurdà’s large megalithic culture, it is worth the hike when rambling through the neighborhood. Down again, on the paved road, the journey goes on, for two kilometers, toward Sant Feliu de Boada. This small town has several well-patronized eateries, like Can Dolç and Can Joan, offering traditional homemade cuisine. It also features a fortified gothic church. Just two kilometers farther away, at the intersection with Route GI-651 to Peratallada and Canapost, another small town bears a very similar name: Sant Julià de Boada. Here, however, everything seems frozen in time, and life goes on, peacefully, for the two last families permanently living in this hamlet. For antic stones lovers the village showcases a Visigoth pre-Romanesque church, one of the oldest temples in the region. During many years it served as a shelter for cattle and was only recently rehabilitated. It is not open for individual visits, in normal times, and only used, once a year, for a Mass at “Dia de Reyes”. After Sant Julià de Boada, my journey went north again, on Route GI-644, toward Ullastret (several medieval towns, in that region, were visited and described in my former itineraries on GT-Rider ). An alternative country road, toward Ullastret, leaves from Palau-Sator . This narrow trail drives near to the St. Andreu hill’s base and affords and interesting panoramic view, a prelude to the archeological site’s visit. On Route GIV-644, just after the medieval Ullastret town , a small branch out (GIV-6442) leads to an important Bronze Age settlement: « Poblat ibèric del Turó de St. Andreu d'Ullastret ». Before driving uphill, to the parking slot, an entrance fee has to be paid . The site’s former inhabitants were Indiketes (Indigets), an Iberian tribe living in North-East Catalunya, with their peak glory period between the 6th and 3rd century BC. After the Roman conquest and a regional reorganization, the settlement fell into crumbles and into total oblivion, till the year 1930, when it was rediscovered, and till 1947, when excavations unveiled the ruins. 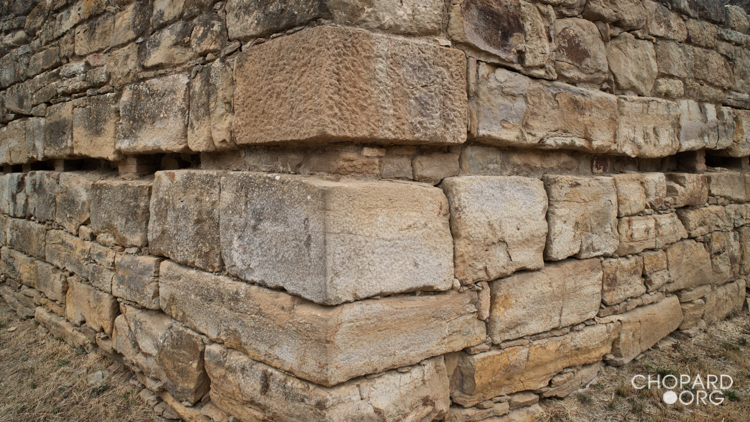 This Iberian oppidum (fortified town), greets the visitors with impressive stone blocks forming the well protected west and south walls. The compound has a triangular shape with a natural slope and lower walls on its north and east sides. The low ground, on the hill’s east side, is a former lake, desiccated in the 19th century after the river Daró’s channeling. When inundated, this nowadays-fertile alluvial plain, was part of the construction’s protection system. A slightly raised terrain, not apparent under dry conditions, shaped an island: L’Illa d’en Reixac. This was also an Indiketes dwelling, but has not yet been excavated. East of the plain, another hill host the small town of Llabia; this was my itinerary’s next destination. A narrow unpaved trail, suitable for dust lovers, starts along the oppidum’s west wall and plunges down to the desiccated lake level. To avoid the dust trail, particularly when driving a car, it is advisable to follow the paved road toward Serra de Daró and, just ahead of this town, and before crossing the river, to drive south-east. Llabia is a tiny medieval settlement, already documented in the eleventh century; it features a Romanesque church, squeezed between narrow streets. Its other attraction is a panoramic view, over the former Ullastret lake, toward St. Andreu hill. Heavy rain might still flood the “old Daró” river plain, as it happened in the year 1977, bringing back the region’s former water submerged panorama. From Llabia, a country road leads to Gualta, another historic town. At the dwelling’s south entrance, a massive construction salute visitors: “El Molí de Gualta”. Built as a medieval fortress, it became an hydraulic powered rice and floor mill and, finally, a power plant. Many Empurdà towns have colorful, local style, eateries; they are often hosted in charming old buildings and cater mostly for locals or for rambling tourists. The most interesting construction, on Gualta’s outskirts, is it’s old bridge (Pont Vell) from 16th-17th century. This important span over the Daró river was, till recently, the only stable connection between the town and its surrounding. A narrow paved passage loops around the chaotic old span’s crossing and continues, as a small byroad, to the intersection with Route GI-643. About three hundred meters north, on the main road, a small intersection leads to a charming restaurant: the Horta de Can Patxei. When rambling around this region, during (Spanish) lunch times, it is worth to consider it for a pit stop. Back on Route GI-643, the itinerary passes Serra de Daró and Parlavà, before bifurcating, on Route C252/C854 toward Ultramort, the town with the fun name (see former trip reports ); it is followed by a long straight stretch. After crossing a bridge over the Ter river, the itinerary reaches Verges, an important crossroad with Routes C31 and GI-634/C-851. A west drive leads parallel to the waterway, but not close to its shores; it passes Jafre and finally reaches Colomers, another small medieval settlement with a traditional layout and an uphill position. The typical narrow streets maize also encircles the town’s Romanesque “Santa Maria” church. In Colomers, the main road passes near to the Ter River, allowing travellers to enjoy to the mirroring water flow. Upriver, the Ter draws a “S” shaped curve through an inhabited landscape. At a distance, a dirt trail loosely follows its course, crossing fertile agricultural land and passing, from time to time, through a luminous sunflower plantation. Finally, a narrow sealed road is reached in Sobranigues, a village built along the railroad. This place also provides an inundable concrete passage, allowing to cross the Ter river, at last during the dry season. The main road, Route C66 is found in Flaça, where the loop is bending back toward the South-East. 3. Púbol, an apex of the Dalian triangle. After driving two kilometers, down from Flaça, on Route C66, an intersection leads to the secondary Route GV-6425 and to La Pera. This medieval town’s castle beacons the travelers from afar, inviting to a visit of its neighborhood, famous for keeping it original layout. Most of the touristic glitter, however, goes to the next hill’s castle, a world famous dwelling since it became home to Salvador Dali and his wife. Crop rotation is a mean to keep the earth productive, and sunflower fields take part in this agricultural cycle. Their luminous yellow hues provide colorful pictures, reminding van Gogh’s paintings. Each season, however, the color patches are found at different places, alternating with dry straw or green crops. As it was restored and adorned under his direction, the “Gala Dali Castle” (Casa-Museu Castell Gala Dali), became an apex of the painter’s Catalonian triangle. It is not the most prestigious of the three places to be visited, but, far from the touristic crowds encountered in Figueres, it provides a serene abode with a flavor of the great artist’s vision. In front of the “lion cupboard”, I was amused to hear a visitor’s comment: “it’s a nice castle but what a strange idea to put a lion’s head on a furniture!” I wondered if some tourists where just looking for shade in the Dali museum. The Puból castle also hosts temporary exhibitions, the one features during my last visit was: “Retrospective Bust of a Woman”. It presented one of Dali’s best-known surrealist objects. After the castle’s visit, It is possible to drive back to the coast along different itineraries. The short path goes straight to Route C66, reaching La Bisbal d’Empordá after about 10 kilometers, and continuing further southeast on this main link. An alternative journey drives through smaller by-roads, for instance to the nearby historic town of Foixà. It features a majestic castle, which is a private propriety, making its visit off limit for ramblers. Another town’s hub hosts the San Joan de Foixà 16th century church, which, in itself, hardly justifies the stop-over. The superficie of the ”Baix Empurdà” is 701,69 km2 (Viquipedia), which is roughly a square of 20 by 35 kilometers. The Empordà is a piece of land, part of the Spanish Catalunya, extending from the Pireneus mountains down along the Costa Brava, till S’Agaro and including a hinterland boarded by the Gavarres mountain range. Since 1936, It is divided in two (administrative) districts delimited, globally, by the Ter river and the Montgri mountain range. It is composed by two plains, the “Alt Empordà” being the larger one. The “Baix Empordà” also called “little Empordà” or “Empordanet”, by its chanter, the writer Josep Pla , is the smaller part . The Baix Empurdà was my motorcycle rambling terrain for five different itineraries (with the exception of a short excursion to La Escala and Empuries, inside Alt Empudà). Elena Ivanovna Diakonova, Gala (1894?1982), executed the deed of purchase of Púbol Castle on 1 June 1970. Two years earlier, Salvador Dalí had decided to keep the promise he had made to Gala back around the 1930s, to give her a castle as a present. « Gala died in Portlligat on 10 June 1982, at the age of 88 years. Her last journey, in the Cadillac that remains today in the garage of the castle, was to Púbol to be buried in the room known as the Tithe Room ». Woohoo more lovely photos & history dear Jurgen. It seems like you really love the place & the history there - close to your heart maybe. I really liked these two pics of the bridge & the road on it. Stunning photos and story to go with them..